Uncategorized – Page 2 – Under the influence! What Would You Do With A Magic Carpet? The magic carpet appears in many myths and fairy tales in many different cultures around the world. In some versions the carpet flies, in others it materializes with its passenger at a destination. Sometimes it is the spoken word that arouses the action in the carpet and sometimes the command is from the mind of the person it is bearing. In later versions of the ancient collection of stories called One Thousand and One Nights there is the story of Prince Ahmad and the Fairy Peri-Banu. This story is narrated by Scheherazade, herself, a character in one of the tales. She tells the story of how the Sultan of the Indies set his three sons the task of each finding and bringing back to him the most wonderful object in the world. The winner would win the hand of a beautiful princess who they all loved and she loved them equally. Prince Husain, the oldest brother, traveled to Bisnagar, (Vijayanagara) in search of such an object. There in the market place he came across a merchant selling a carpet for a huge price. At first the prince was skeptical asking how the merchant could justify demanding such a huge sum. However, after the powers of the carpet were demonstrated he readily paid more than the asking price. The carpet the prince bought teleports, rather than flies its owner where ever they want to go. It is commanded by the will of the owner – “upon other site will, in the twinkling of an eye, be borne thither, be that place near hand or distant many a day’s journey and difficult to reach” – So all Prince Ahmed had to do was think of where he wanted to go and the carpet would instantly materialize there with him aboard. Aladdin is another character from One Thousand and One Nights and often associated with flying carpets. This is a myth from the modern world, notably, Disney rather than history. The wind was said to be obedient to Solomon’s will and would safely carry the carpet and its passengers to his desired destination at high speed. The carpet and it passengers were shielded from the sun by a huge canopy of birds. Solomon was a very great king acclaimed for many great achievements. Legend tells that when he became proud of his great feats the carpet would give a mighty shake causing 40,000 people to fall to their deaths. 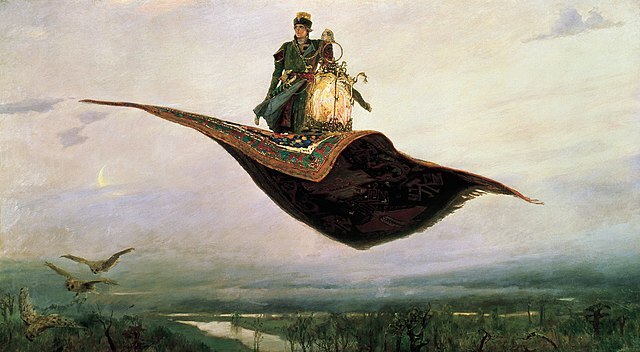 The myth of the flying carpet is older than One Thousand and One Nights. In 130 BC, King Phraates II of the Parthanian Empire is said to have flown on a carpet from the top of the Zagros Mountains to confront the Seleucid king, Antiochus VII, raining down lightning and fire to kill him and his army. After this great victory he was given a triumphal celebration and is reputed to have floated on his carpet over the crowds accepting their applause. King Phraates and Antiochus VII were historical figures and warred with each other resulting in the defeat of Antiochus VII. However the victory was achieved by more traditional military methods. In 260 AD King Shapur I was reputed to have used a flying carpet to abduct the Roman emperor Valerian. King Sharpur was said to have flown into Valerian’s bedroom while he was asleep and pulled him onto his carpet to take him prisoner. So, in mythology and fairy tales, magic carpets were marvelous and wonderful objects. They could take you anywhere in the world in the blink of an eye, or take you on a magical tour of your own choosing. If you had your own magic carpet that would obey your command, taking you to anywhere in the world, to any moment in time, where would you go?